Electric Starter: No hassle because easy to operate in one click. Engine Switch: Really safe transport strikes due to rapid killing machine if needed. Provision for 2nd Shock Absorber: May watch for extra shock when fitted with sidecar. Fuel Tank Design: For traditional TMX Classic Fuel tank. Needle Carburetor Type: Conventional Carburetor be tested and reliable. The New Honda TMX 125 Alpha Equipped with engine capacity of 124, 11 cc, 4-Stroke, Air-Cooled, OHV is juxtaposed with a 6-speed transmission. The machine is capable of spewing power to reach 7.21kW at 8000 rpm and torque 9.36 Nm at 6500 rpm. 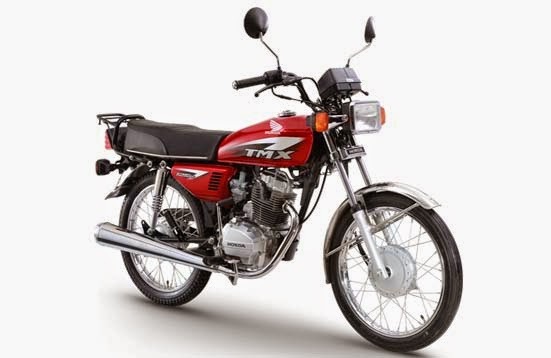 Thus glimpse of Honda TMX 125 Alpha, all information regarding the specifications or prices taken from the official website of Honda Motor Philippines, I hope this brief review can be a reference for you to know more details about Price, Features and Specifications Honda TMX 125 Alpha. thank you for your visit and hopefully useful.